Engineer Alfieri Maserati founded his company in Bologna in 1914, along with his brothers Bindo, Carlo, Ettore, and Ernesto. 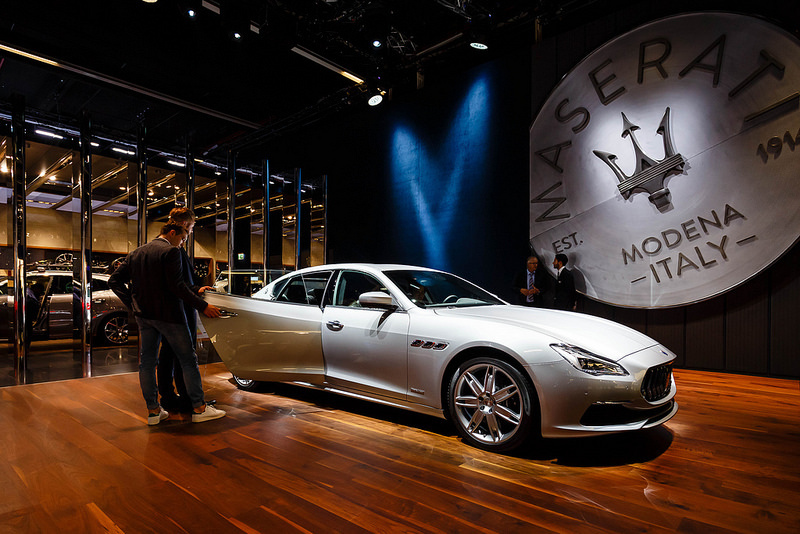 A sixth Maserati brother, artist Maria, was inspired by the trident of Neptune in Bologna's Piazza Maggiore to create the company's famous symbol. When the surviving brothers sold their shares in the company to Adolfo Orsi in 1937, Maserati relocated to Modena, not far from the Museo Enzo Ferrari. In 1939 and 1940, Maserati's 8CTF became the first (and so far only) Italian car to win back to back victories in the Indianapolis 500. Afterwards, Maserati commandeered to make parts for the war, then returned to making cars, turning increasingly to luxury Gran Turismos. Since 1993, the company has been owned by Fiat, which sold 50% of the firm to arch-rival Ferrari, which helped to turn it around from the brink of bankruptcy; in 2005 it was split from Ferrari and is now partnered with Alfa Romeo. And in the past couple of years, they've had record sales, since 2013 producing cars in Milan as well as in Modena. The showroom, attached to the factory, displays the latest models and a diorama of the history of the marque. Hours Showroom open Mon-Fri 9am-5pm, adm free. Closed public holidays and in August. Driving Courses Your chance to drive a GranTurismo GT4 racing car or the legendary MC12 Versione Corse, side by side with F1 driver . There are seven different options, four on the track at Varano de' Melegara, 30km southwest of Parma, by the manufacturers of Dallara Indy and F1 cars. From €650 for half a day.